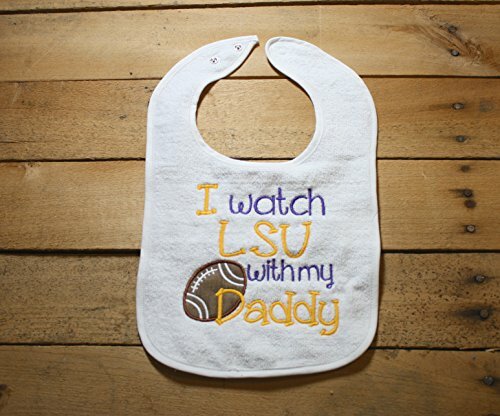 LSU Bib I watch LSU with my Daddy. I can change the colors of the thread for a girl or a boy. Look at some of my other listings for different color schemes. If you still don't see a color scheme you like just message me. I will work with you and make it any color. Any other questions feel free to message me. ***Return Policy*** These items will be custom made to order. Because of this there will not be any refunds given. Please review your order carefully and ask any questions before placing your order. ****SHIPPING**** Your order will ship between 5-7 business days. If you would like to have your order shipped sooner you can choose the rush to ship option. The rush to ship option will make your order the next order made. The shipping method will be the same, but your order should be shipped within 2-4 business days.